BILLY RAY: “You think I didn't know that? I suppose you also think I should be yellin' 'Where's my hedge fund, M-F'er?” 'cross the exchange floor, too! That's wrong, Louis! That's WRONG! You probably remember the anti-establishment, and Reaganomics-(and Freaknomics/Bell Curve) repudiating, 80's comedy classic “Trading Places” starring Dan Aykroyd and Eddie Murphy. It was an uproarious send-up of that go-go, “Greed is Good” era, using the worst excesses of the time's amoral capitalism to lay the system bare. The movie was as funny as all hell, with the hilarious, arch performances of Don Ameche and Ralph Bellamy as the craven Duke brothers, and it boasted a bunch of great comic set pieces—Aykroyd's bottom-hitting meltdown at the Dukes Christmas party, the train berth disguise sequence, Al Franken and Tom Davis' turns as the slacker train baggage handlers (dealing with an in-heat gorilla! 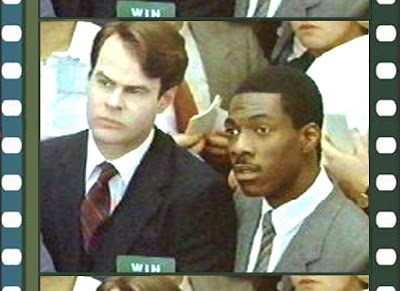 ), and of course, the uproarious trading floor scene in the movie's climax, where Louis (Aykroyd) and Billy Ray (Murphy) swarm into the wild scrum in the exchange's main room. There they were...in the midst of a multitude of crazed people hopping, and waving paper, a din of brokers and pastel-smocked trade reps screaming at the top of their lungs during the “run” on frozen orange juice futures. For many, that scene, as well as other versions of it in other films came to represent what “The Street” was all about. There was a lot of truth to it. Pre 9-11, when tourists could waltz above the crazy floor, during runs and “bolts” (bear runs “away” from buying), and one could actually see a version of that “Trading Places” exchange lunacy. But now, more than post 9-11 cosseting has lessened the chances of seeing that snake pit of American capitalism in action. The prevalence of online day trading, and automatic computer curbs on activity when a sell-off goes over the rails has brought about a considerable lessening of the numbers of people actually on the floor. The “zoo” ain't what it was. If you've watched the business channels over the last few years, you've noticed it. The “madness in the pit” of the last 70 years is done—and because of it, they're actually shrinking the trading floor itself. But the buzz emanating from its famous trading floor is dying down as computerized trading has rapidly reduced the need for face-to-face transactions. In the next several weeks, the exchange plans to shut two trading rooms that were added decades ago, when its status as the place to buy and sell stocks was unchallenged. When the latest retreat is complete, the exchange floor will be half the size it was at its peak. The “crowd” — the brokers and clerks on the floor — has dwindled to about 1,700 from a high of more than 3,000. Before the exchange became a public company in 2005, its members controlled 1,366 seats, or licenses to trade. Now, about 800 brokers pay the annual $50,000 fee for a license. And so ends another little piece of New York history. American history, actually. The little things you take for granted, and think will be there forever—the bustle of the traders and the reps, clogging the floor, creating that roar, then filling the side streets like Trinity Place, and the surrounding single block alley/streets during lunchtime or for tremble-fingered (on rough days) smoke breaks. Replaced by...guys at computers, algorithms, and timed buys and sells. We've addressed this sort of thing before—the phenomenon/reality of how our environments—our cities seem to change right under our very feet. Sometimes the change can be for good—like the revamped LIRR terminal at Jamaica Station, or the addition of free WiFi at many of the city's parks (Bryant, Madison, and Central—I've blogged from each one) and sometimes for bad, as in the systematic killing off of places in New York where people, particularly it's young people, can communally engage in recreation—like the closing of the Skate Key, Roxy, and finally the Empire Roller rink. The well-anesthetized neutering of the Stock Exchange's once wild and wooly floor won't hurt any recreation-starved kids per se, or coarsen a city...but what it does is signal just a bit more, the submerging of the town's sass—it's getting harder and harder to see the city...“sweat”, as it were. To go all “McLuhan” about it, New York is becoming a cooler, more internal-dealing city—giving up its hot, more extroverted, outré elements more every day. I suppose that makes it an easier-to-digest place for us all, but we are indeed losing something. No one is championing the return of the worst excesses of the city at its anarchic peak, but a certain...“Wonka-ification” has settled in, where the place has become a still-awesome, but chilly place of wonder. It glitters. It's shiny. But less and less, do we see its “stubble”. Increasingly, it is a showplace where the soul is hidden, and at least as far as what's allowed to be seen, run by cookie-cuttered “Oompa-Loompas”. The city of sharp elbows, “stubble”, and the onion-breath from a just-wolfed hot dog? Gone. Sipowicz's gruff town has been traded in gradually for the buffed, sterile one of Gary Sinise's “CSI-New York”. Can't front...I'm missing it. And I'm not alone. And I can't help thinking how much less uproarious that climax of “Trading Places” would be had that pivotal scene been played out on a computer—like much of today's trading—alá Sandra Bullock's now-ridiculous, “thriller/yawner” “The Net”. WINTHORPE: Think big, think positive, never show any sign of weakness. Always go for the throat. Buy low, sell high. Fear? That's the other guy's problem. Nothing you have ever experienced will prepare you for the absolute carnage you are about to witness. Super Bowl, World Series - they don't know what pressure is. Via this Dual-Xeon powered laptop, it's either kill or be killed. You make no friends on the cyber-floor and you take no prisoners. One minute you're up half a million in nanotech and the next, boom, your kids don't go to college and they've repossessed your Maybach. Are you with me? WINTHORPE: Wha-ohhhhh...fiddlesticks! It crashed! God, I hope there's a free terminal at the internet café down the street. (Beat) It's looking crappy, Billy Ray. BILLY RAY: (Sighs) Feelin' crappy, Louis.